Rhubarb, one of the best parts about spring, is late this year in the Northeast. We just started seeing this perfect pie fruit at farmers markets within the last week or so – I’ve been looking for it since mid-April! Rhubarb is definitely a favorite of mine. Always a fan of tart and tangy, rhubarb is juicy, sweet, yet slightly sour when baked with sugar. Although my grandmother didn’t have many recipes for it, her mentor, James Beard has a few in “The James Beard Cookbook,” which is where I got the idea for this super simple baked rhubarb recipe. Growing up in Minnesota (the rhubarb capital, in my opinion), rhubarb was a spring staple that grew in a small garden next to our driveway (and often all the way thru fall). It was reliable and always available for a last minute pie or crisp. The fibrous stalks are similar to celery but red and the flavor is fruity and tart instead of watery and flat. Every year I am shocked by the price of rhubarb here in the NY/NJ area where this everyday almost weed-like fruit in Minnesota runs anywhere from $3.50-$4.50/lb here. This doesn’t stop me from whipping up some of my rhubarb favorites and maybe some day I’ll even take my mother up on her offer to drive a truckload out from Minnesota (is the rhubarb business any good in the northeast?). This is the first of many rhubarb recipes I’ll be posting this year and quite possibly one of the easiest. 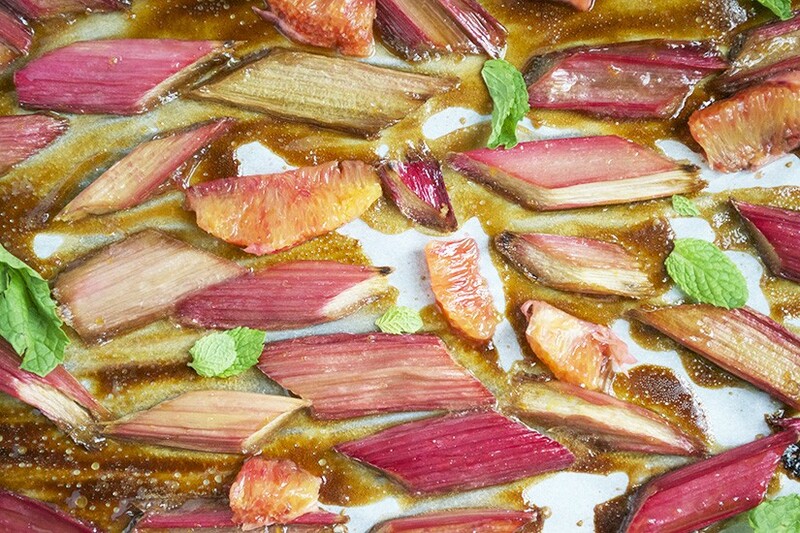 Rhubarb is cut and mixed with brown sugar and blood orange juice and then baked until tender. It can be combined with blood orange segments and served over anything from yogurt to ice cream or even granola. Simple, colorful, and full of tangy rhubarb flavor. Happy Spring (and Rhubarb Season)! Preheat oven to 350 degrees. Grease or line a baking sheet with parchment paper. Wash the rhubarb and cut in 2 inch pieces. Place in a mixing bowl. Zest blood orange and add to the rhubarb. Peel and segment the orange (segments can be made by cutting the peel off with a pairing knife and then slicing between the membrane of each segment). Reserve segments. Squeeze the juice from the remaining membrane/body of the orange over rhubarb. Add sugar and mix well, ensuring that the rhubarb is fully coated. Spread rhubarb in one layer on the prepared baking sheet. Bake 20-30 minutes until tender. Mix rhubarb with orange segments and serve over ice cream, frozen yogurt, or with yogurt and granola. 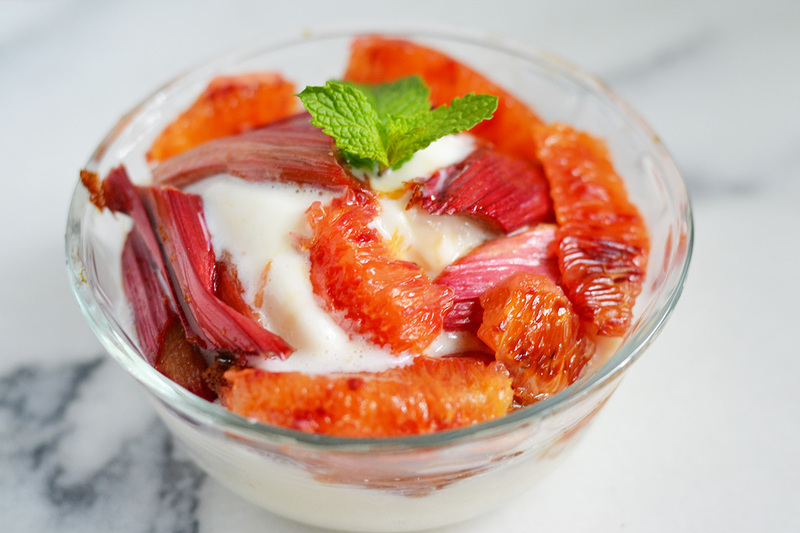 I was wondering if baked rhubarb and orange alone is gonna be worth my while, but that photo with them in a yogurt cup just sets everything right! I can even construct a parfait with these little goodies! I came across your blog in instagram, and absolutely loved it ! Do you want to talk about becoming a Chicory App Recipe Partner?